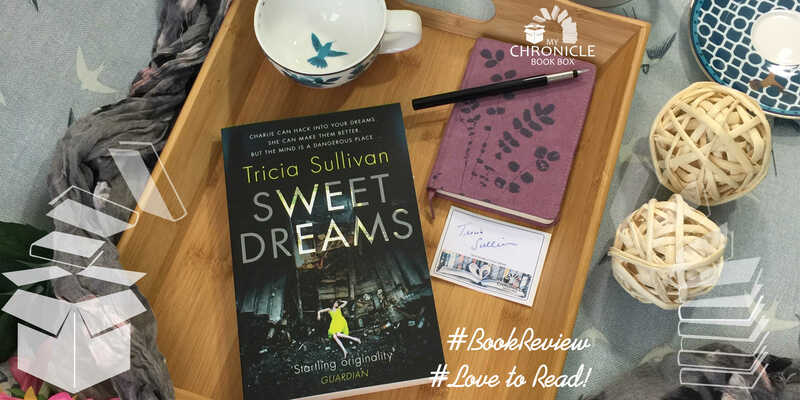 A My Chronicle Book Box review of Sweet Dreams by Tricia Sullivan. This book was included in the November 2017 Science Fiction and Fantasy My Chronicle Book Box. Charlie has an unusual, and she believes unique, gift; she can enter people’s dreams and uses her ability to help people having nightmares. It is not without it’s drawbacks as she also suffers from debilitating narcolepsy (a condition I had very little knowledge of before reading this book) and this has severely impacted her life. Having lost her home and her job, Charlie is now a live-in carer for O who makes for a rather odd landlady but supports Charlie in her therapeutic dream hacking business. Charlie is tough with a rather sarcastic sense of humour and is trying to make the best of things however they take a rather dark turn when one on Charlie’s clients (who is also the current girlfriend of her ex boyfriend) dies while Charlie is with her in her dreamscape. It seems Charlie is not unique after all and now she is in danger because another much less benevolent person is also able to infiltrate dreams, including Charlie’s. I really enjoyed this book even though I found the idea of someone infiltrating your dreams when you are at your most vulnerable i.e. asleep, rather creepy. It was clearly Tricia’s intention that when reading it you should feel just a little on edge and it was done very successfully. The book was paced really well so that I read it in a very short time given it is a lengthy book. Overall this was an intelligent and interesting read with some good action scenes and sarcastic humour. Highly recommended for SF and mystery lovers! Just maybe not right before bedtime?